The Spiel Fair in Essen is finished and as usual, I had a lot of appointments to present my new game concepts. The meetings were exhausting, but by occasion, there were some nice encounters too. Here I'm posing with the charming ladies Wen Chi Lee (left) and her colleague, Wen Chien Wu (right) from Swanpanasia. Their company distributes the game Saboteur in Taiwan and China. According to the ladies, "the game" (which is named so because most local people can't read the title "Saboteur") is very popular there. 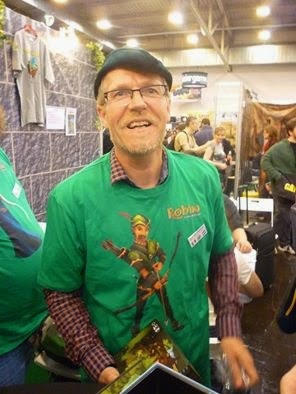 Here, I'm promoting the new game Robin on the booth of Flatlined Games. I got nearly a cramp in my wrist from the multiple signings ;-).